Heat oven to 375°F. Spray 13x9-inch glass baking dish with cooking spray. In large bowl, mix pasta, frozen meatballs, pasta sauce, water and Italian seasoning. Pour mixture into dish. Cover tightly with foil. Bake 40 minutes. Remove dish from oven; stir mixture thoroughly. Sprinkle with cheese. 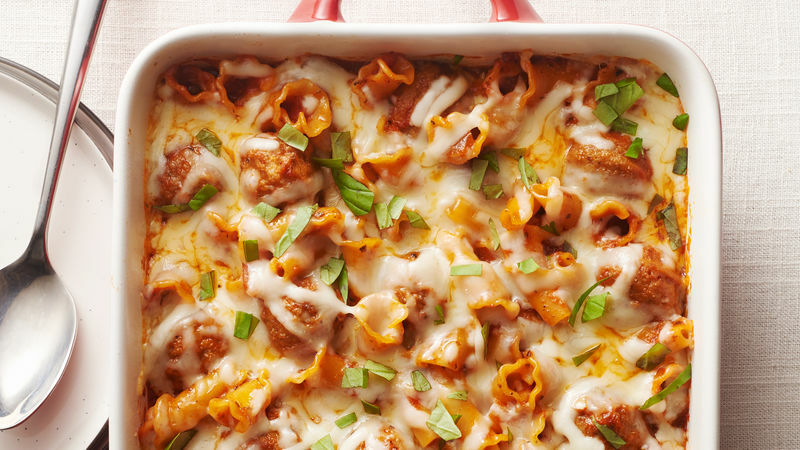 Bake uncovered 5 to 8 minutes longer or until pasta is tender and cheese is melted. Garnish with basil leaves before serving. Shredded Italian cheese blend may be substituted for shredded mozzarella cheese. Stir in 1/4 to 1/2 teaspoon crushed red pepper flakes to add a subtle spicy heat to this pasta.